Are you one of the people who can’t go on waging the mundane daily battles without a cup of coffee to get you going? If the answer is “yes”, you’ve come to the right place because your favorite piping hot beverage is just a push of a button away. 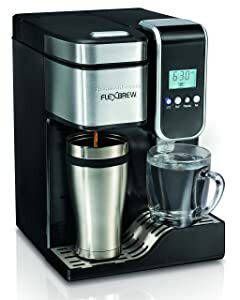 So, let’s take a look at how to find the best coffee maker with hot water dispenser and water line currently sitting on the market. Are the Water Reservoirs Removable? 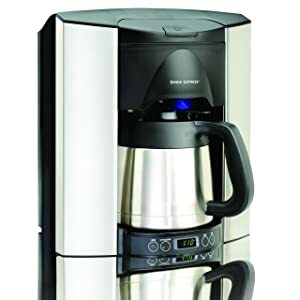 You see, some of the modern coffee makers come with a built-in hot water dispenser that allows you to prepare tea and hot chocolate making your mornings that more pleasant. This function comes off as a real blessing. First, you don’t have to keep two clunky appliances in your kitchen - coffee maker and hot water dispenser are packed into one perfectly streamlined package which makes a far more convenient and energy-efficient solution. Second, with hot water dispensers, preparing tea and hot chocolate comes at an instant. No more waiting, no more scorched leaves that are the result of boiling water (since hot water dispensers use the temperatures that are below boiling point, the beverages like green tea can preserve their taste and properties). Of course, all these amazing things are useful only as long as you are able to quickly refill the water. Therefore, it is in your best interest to find a unit that features a removable water tank so you don’t have to move the whole thing when you need to replenish the water supplies. Since this functionality makes such an important feature, all of the units with hot water dispensers we’ll cover below have removable water tanks. However, coffee units that are being used very frequently need to be refilled quite often, so the removable water tank doesn’t really live up to the task and refilling water can become quite tedious, and in the cases of workplaces, can lead to some very spirited discussions. In these situations, it is best to use a coffee maker with water line that can be hooked directly to the public water supply through a dedicated tubing system. This option is very often used for commercial purposes (e.g. Starbucks), where a certain level of automation is absolutely necessary. Of course, this system has its advantages and disadvantages. The good thing is that if you are running a coffee shop or you are simply an avid coffee lover, you can just keep pouring, and the automated reservoir system that involves a pressure regulator and shut-off valve will take care of the rest. The obvious downsides are that connecting this system to water supply requires some plumbing experience, and you do use the public water supply that’s often lacking quality. However, the latter issue can be easily addressed with a water filtration system. 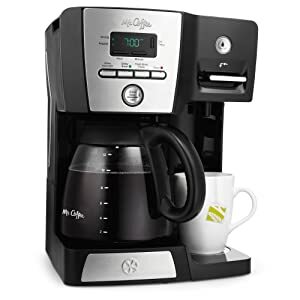 Much like coffee makers with built-in hot water dispensers, these units come in a variety of different options, so for the purposes of the review, we will split the products into these two broader categories. 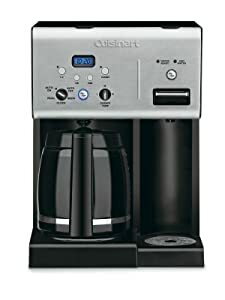 Featuring a pretty substantial kettle that can easily store up to 12 cups of coffee, Cuisinart’s contender makes an obvious choice for large families and busy offices. What sets it apart are programmable functions, auto shut off, and adjustable carafe temperature that preserves the beverage just the way you like it. The separate hot water system can store up to 54 ounces of water, it is operated independently and, what’s also important, it can easily be dismantled from the main unit. Another great thing is that, in spite of its generous storage, the unit feels very portable, so it can be easily packed for travel. On the downside, the bottom panel is rather prone to rust, so you will have to take a lot of care while cleaning. The safety lock is very exposed and doesn’t feel too safe at all. Although this coffee maker can brew 12 cups of coffee at once, one of the neat features Hamilton Beach sneaked up in its vast arsenal of features is an option to brew a single serve. Having this choice is always a plus. Besides that, you also get a very beautiful and compact stainless steel body, brew strength selector (with the option to choose between Regular and Bold) and a pretty clear timer that allows you to program the brewing time up to 24 hours in advance. The option to quickly put in a pre-packed flavored pod instead of making your own mix comes as a cherry on the top. Unfortunately, the kettle handle feels very flimsy and cleaning the unit is more convoluted than it’s supposed to be which somewhat drags this otherwise good product down. This coffee maker has a lot of good things going on. First, there is a neat dual water window that makes overfilling the storage compartment a thing of the past. Second, there’s an option to put the water dispenser into Grab-A-Cup auto pause regime that will give you enough time to replace the cups once the brewing is over. 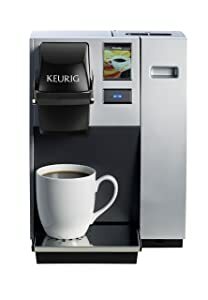 Take into the equation a sturdy, if somewhat clunky, black body, 12 coffee cups capacity very intuitive controls, brew strength selector, and programmable brewing options, and you get one pretty well-rounded package. Or at least it would be if not for some of the issues regarding the overall quality of the product. Namely, some of the units that were shipped to customers showed serious signs of malfunction after only a couple of months of use. Now here’s another product coming from Hamilton Beach’s kitchen, and we’re sorry to say that, despite its flaws, the previous product we reviewed was a much stronger effort. This time, you do get all the bells and whistles you would expect from this type of coffee maker – the unit brews up to 14 oz of coffee into cup or travel mug and dispenses 16 oz of water. The LED display is clear and gives you a lot of programming options to play with. Also, the coffee maker makes a stunning visual addition to any type of kitchen. The issue at which things start to fall apart is the coffee pot that becomes clogged incredibly easy. Furthermore, with the price that almost doubles some of the products we reviewed above, it’s hard not to notice the unit does very little to earn it. Being the only commercial coffee maker on the list, it’s easy to conclude that Bunn’s product plays entirely in a league of its own. But, the unit is still compact and affordable enough for us to give it a fair trial so why not. After all, you get a top-notch two-kettle performance, high-quality stainless steel body, an astonishing 490 oz of water to play with. The unit is also very reliable and manages to put out four gallons of coffee each hour. If you need a productive and reasonably affordable professional coffee maker, you won’t find a better one than this. However, remember that commercial units like this are often deprived of all fancy or, for that matter, useful amenities like digital displays and advanced programming options so you’ll have to do the things the old-fashioned way. There is a lot to be concluded about this product by reading its title alone. First, we are talking about Keurig, so you can expect a top-notch performance. Second, the unit brews only a single K-Cup portion at the time which is a small bummer. But, as a consolation prize, you do get easy-to-fill 90 oz reservoir which gives the product a great autonomy, adjustable brewing temperature, auto on/off setting and a beautiful touch screen display to operate the thing. The coffee maker also allows you to choose between several brew sizes (4, 6, 8, 10 and 12 oz) which drastically improves its versatility. So, in the end, you are left with a pretty solid and affordable product with few drawbacks. If only the plumb kit was included in the package. And for the very end, we have a unit that is much better suited for people who like their coffee in a substantial (and easy to clean) 10 cup carafes that keeps the beverage hot for several hours. Of course, you have an option to choose between single mug, half and full carafe portion sizes. The option to use K-Cup pods is sorely missing, but you can’t have it all in one product. The other thing that could be managed better is an installation that is way too convoluted for a regular user. But, once you hook the unit up and get it to work, you will enjoy a versatile set of features, seamless operation without recovery times, and a nice display that allows you to operate all these things. Essentially, the choice between this and the previous unit largely boils down to which type of coffee you prefer. But, besides these categories are there any other considerations you should take into account when making a purchase? Of course – let’s take a look at some of the most important. 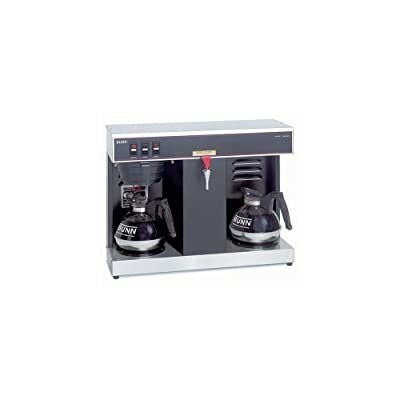 In most of the cases, coffee machines and espresso machines are sold as separate units. However, the market is filled with interesting hybrids that allow you to brew more than one type of this fantastic beverage. So, if you are a diverse coffee lover, using only one machine instead of two is the more space and money-economic decision. Some people don’t like to brew coffee whenever they feel like drinking. Others like to brew more coffee in the morning just in case their families decide to join the party later. Both these groups would largely benefit from the thermal carafe that can keep their coffee hot throughout the day. Although we already partially covered this issue while talking about the coffee maker types (drip vs. single-serve) it should be mentioned that there are pots and there are pots. If your unit is going to be used by a whole family it is in your best interest to find the biggest kettle possible. Larger units are often labeled 10 to 12 cups. Essentially, your coffee maker should be easily dismantled and put together. Also, you should choose the units whose parts can be cleaned in a washing machine. These days, coffee makers are mostly controlled by buttons, dials, and LCDs. What’s important to know is that neither one of these options is better than the others by itself. 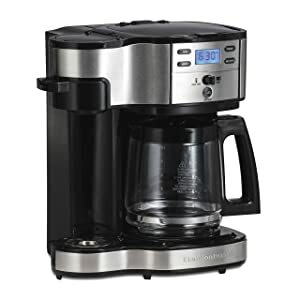 The coffee maker controls are good only as long as they are clear, precise and easy to operate. Here, you get all the small nuances that make coffee lover’s life so much easier. For instance, better products on the market give you an option to choose the language or adjust brew temperature. Also, it is always good to have an energy saving feature that will shut down your unit after a period of inactivity. In the end, all of the aforementioned coffee makers have their set of pros and cons, so the final decision will depend on your needs and your drinking habits. However, as long as you feel that magic aroma spreading throughout your house early in the morning, you can’t make a wrong choice.